Today’s review features the Body Vibe x Star Wars Haysian Smelt necklace set. Ever since I heard this set was coming (in our interview with head Body Vibe x Star Wars designer Rob Booth), I knew I had to get my hands on it! The necklace set shared by sisters Paige and Rose Tico is featured prominently in The Last Jedi – the Haysian Smelt necklaces and the Japor Snippet necklace are some examples of the rare instances jewelry is specifically talked about in a Star Wars film. Wear your love of the blockbuster movie Star Wars: The Last Jedi with these replicas of Paige and Rose Tico’s Crescent Moon Haysian Smelt Pendant Necklaces! 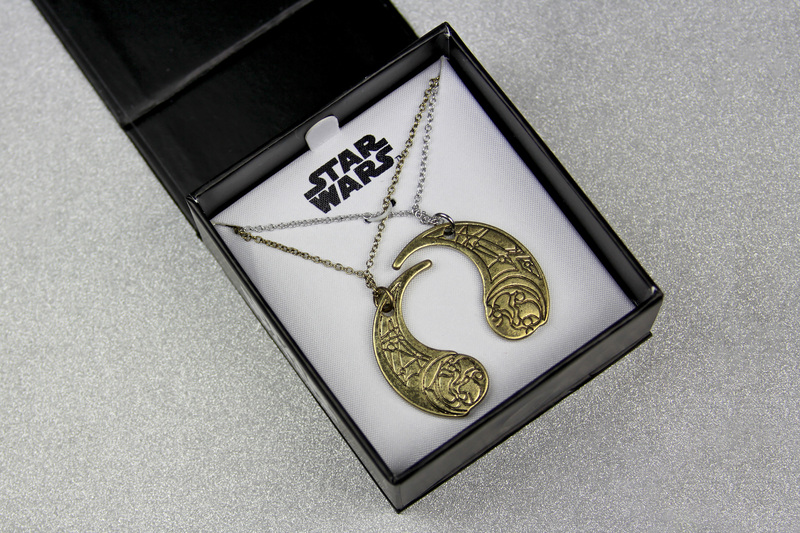 This officially licensed Star Wars jewelry set includes two real metal pendant necklaces, each half in the shape of a crescent moon. Each pendant hangs from a chain necklace – one gold, the other silver – that measures 18-inches and attaches via a metal lobster claw clasp. Comes packaged in an attractive Star Wars branded box with magnetic closure. Perfect for cosplay, everyday wear or display. Or give one to your best friend/ sibling to proudly show off your unbreakable bond! The necklace set is priced at US$20.00 to US$22.98 per set – shipping rates/policies vary by Amazon seller (international customers can order via a US mail forwarding service). The necklace set came packaged inside a black cardboard gift box. The box features the Star Wars logo printed in white on the top lid and sides, while the standard Disney, Star Wars, and Body Vibe/SalesOne copyright information is printed on the bottom. The box closes with a top flap lid, and secures with a magnet strip across the front of the box. The gift box is a great presentation if giving this set as a gift, which is a popular idea for this particular set. Inside the box, the necklaces are secured onto a white insert card – the necklace chains are passed through a slot in the top corners of the insert card, and held together with a small white ‘twisty tie’ in the center. The rest of the chains are secured to the back of the insert card with clear tape. The pendants can knock together while packaged inside the box, but this particular set made it all the way through international mail to me and still look fine! 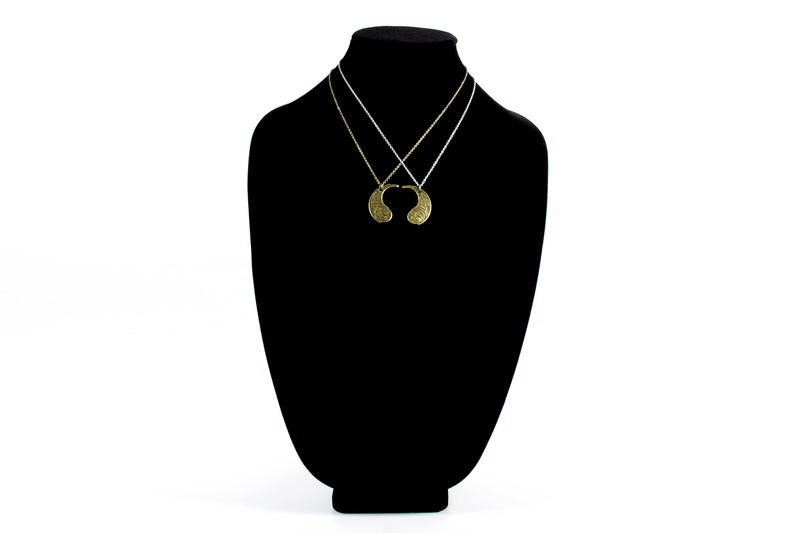 The Haysian Smelt necklace set includes two necklaces, each with a crescent shaped pendant. One pendant is strung on a gold-toned chain, while the other is strung on a silver-toned chain. The Amazon website listing notes the necklaces are made of ‘base metal’. Rose’s medallion is a stylised ensign of the Otomok system, representing Hays Minor. It is made of pure Haysian smelt, a transition metal with incredibly efficent conductive properties. It is the partner medallion of the one worn by Paige Tico. Hays Minor is the homeworld of sisters Paige and Rose Tico, so the pendants are obviously of significant sentimental value to them – a connection to each other when they are apart. The inset design looks like a circular planet and a star-chart of the sky above. Both pendants feature embossed line details, which are accented with antiquing. 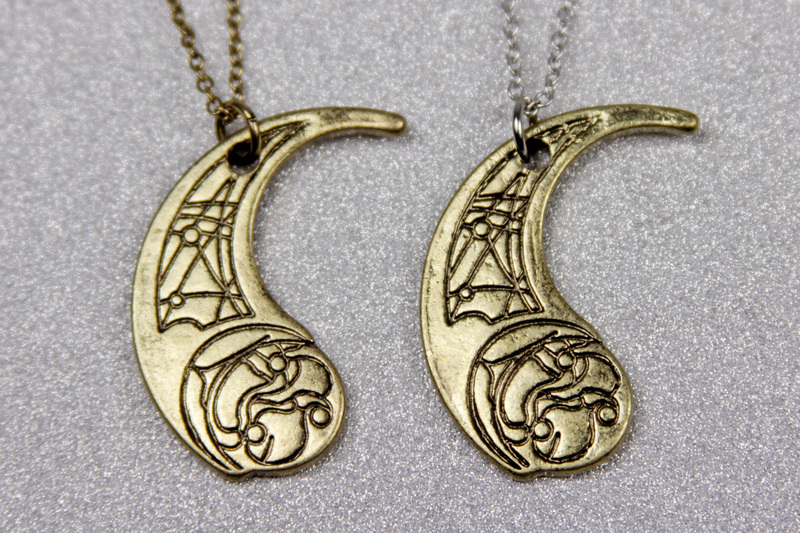 The two pendants are in fact identical – though the design for the ‘front’ and ‘back’ is different. When the ‘tip’ is pointing right, the design includes a ‘Capital Letter A’ in the ‘starry sky’ portion of the design, and when pointing left there is an ‘Exclamation Mark’ in the ‘starry sky’ and small separate diamond shape between the sky and planet (the diamond shape is not present on the other side). Of course the two Haysian Smelt necklaces in the film are not worn on chains – Paige wears hers on a brown cord, while Rose wears hers on a silver wire. I think the gold and silver toned chains used for this set are a good balance between costume inspiration and wearable jewelry design. Of course, if you are looking for a closer version for an everyday cosplay outfit, you can replace the chain with the necklace style of your choice. 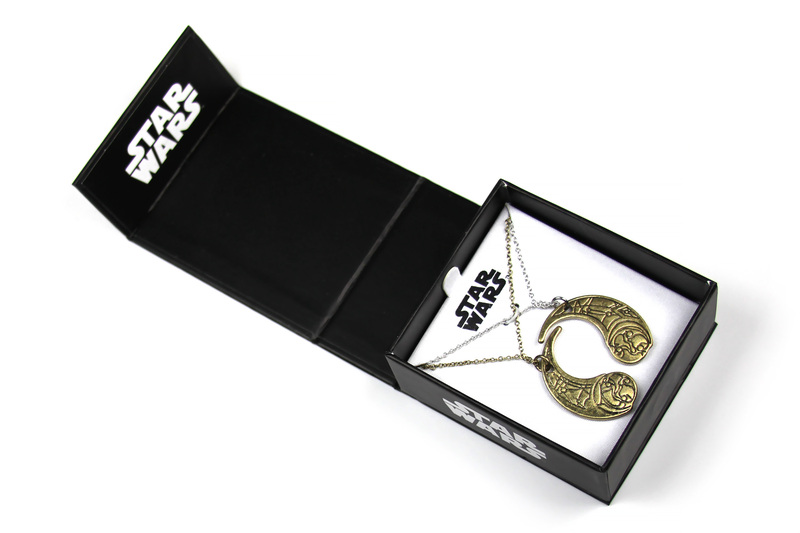 Usually Star Wars necklace sets are divided into two categories – ‘Best Friends’ necklaces that typically feature R2-D2 and C-3PO, or ‘I Love You’ – ‘I Know’ Han Solo and Princess Leia romantically themed necklaces for couples. This is a fantastic gender-neutral necklace set that can be shared with whoever you choose – spouse, partner, friend, or family member! 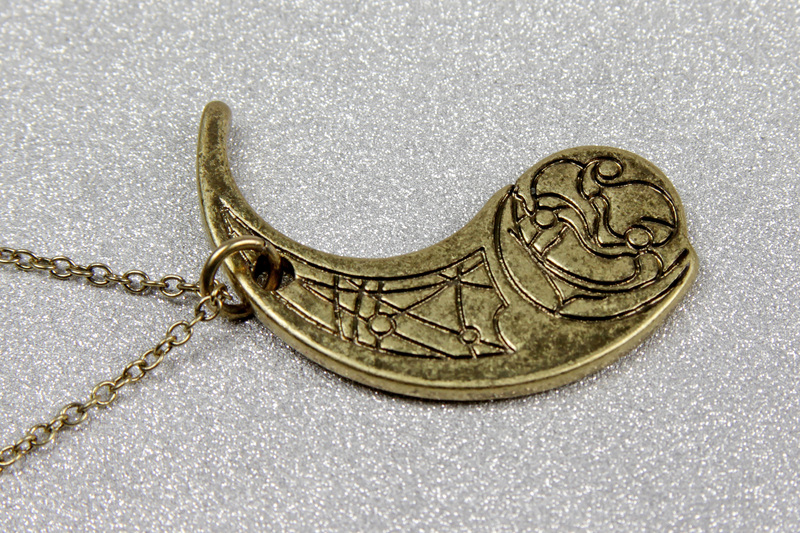 While women wear the pendants in the film, the pendant itself is quite neutral – neither too feminine nor too masculine. While the crescent shapes look like they would fit together in a ‘ying yang’ style design, they do not. Perhaps using a ‘best friends’ style half-n-half necklace shape would have looked too ‘real world’ for the costume design? 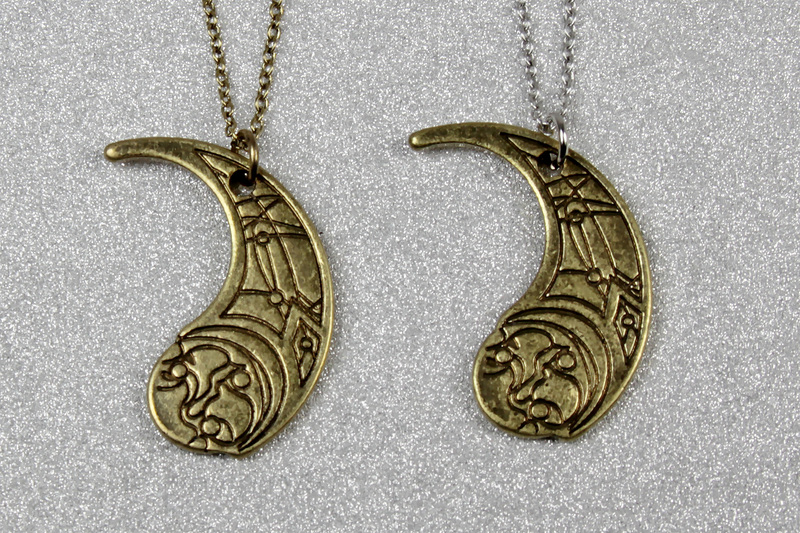 In any case, I really like the soft crescent moon shape, it translates very well into a wearable piece of jewelry. For fans who prefer subtle Star Wars jewelry designs, these necklaces are perfect for wearing anywhere. 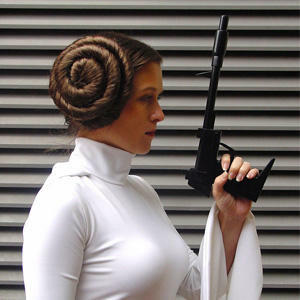 Recognisable to Star Wars fans, but the lack of obvious Star Wars symbols or characters means they will go unnoticed by everyone else – though of course you may get asked where you got such an interesting design! 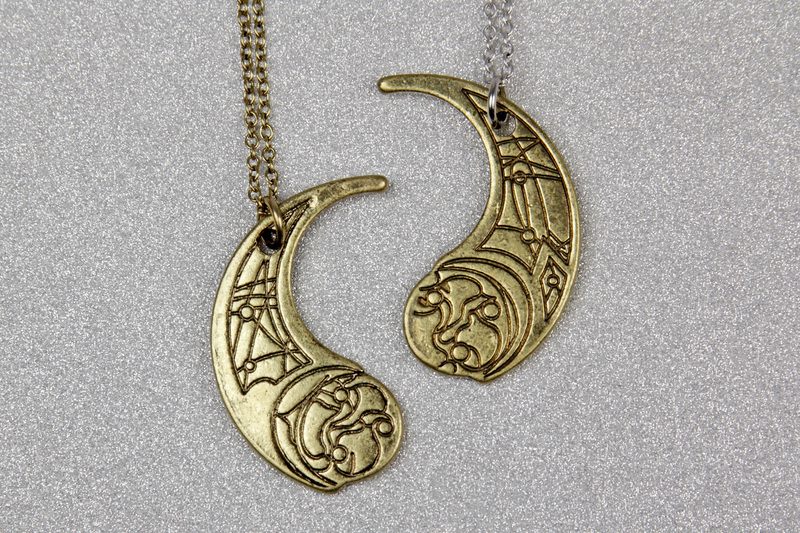 The surface of the pendants have a gold-tone finish with antiquing. This appears a little more prominently in my close up photography, it doesn’t look quite as strong in person. The antiquing gives the effect of jewelry that has been worn, i.e not shiny new. This fits really well with the inspiration of the Tico sisters, fighting for the Resistance, rather the glamour and shine of say, Canto Bight. A little worn, well loved, and something to hold onto in tough times. 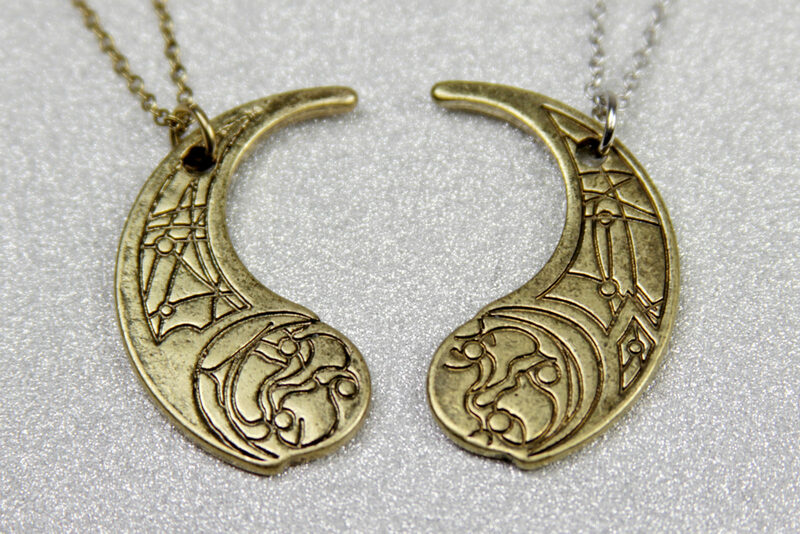 As mentioned earlier, the two pendants are identical in size. Each pendant measures approximately 3.65cm tall, approximately 1.4cm across the widest ‘circle portion of the pendant, and just over 1mm thick. The edges are all sightly rounded, and the end point is also rounded so it is not sharp. Without directly comparing to the screen-used necklaces, I can’t say if this is exactly true to size with those used in the films. 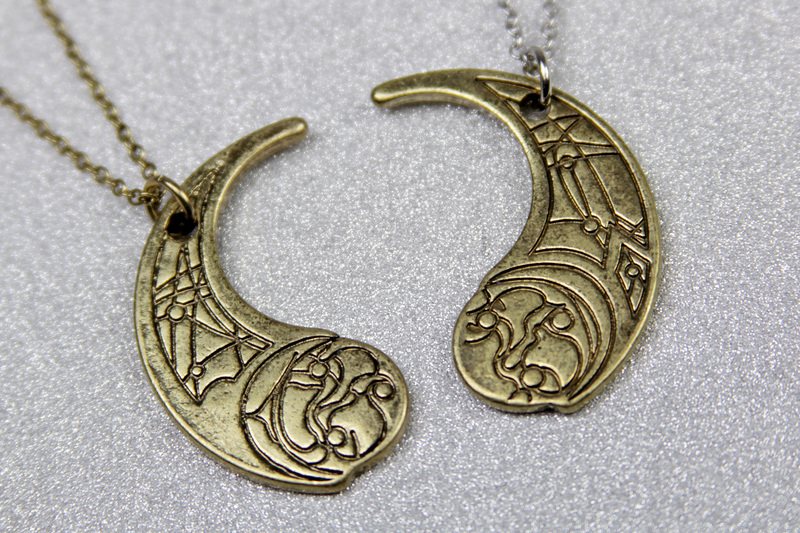 These licensed jewelry versions are obviously designed for everyday wear, rather than an exact costume replica – I think the size is perfect for this design. 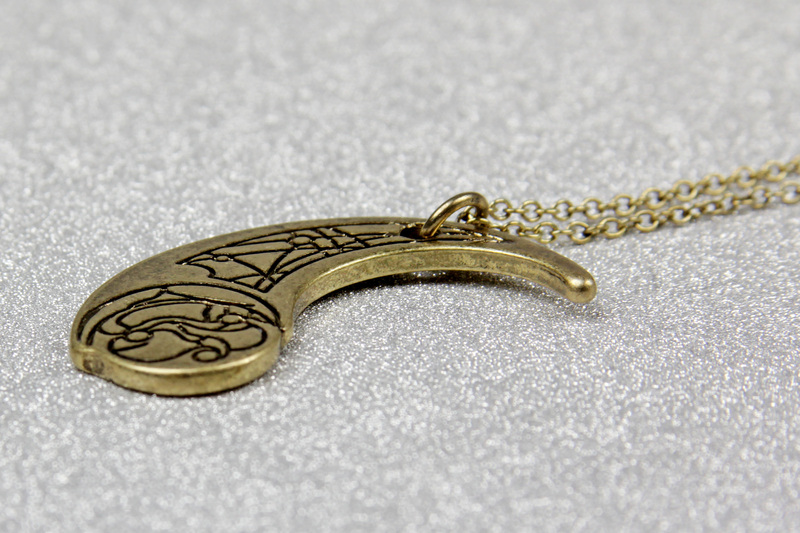 The necklaces each have a ‘lobster claw’ style jewelry clasp, with a length of wider-link chain for adjustment. The end of the adjustment chain features a small bead-like charm, in a matching colour to the necklace chain. 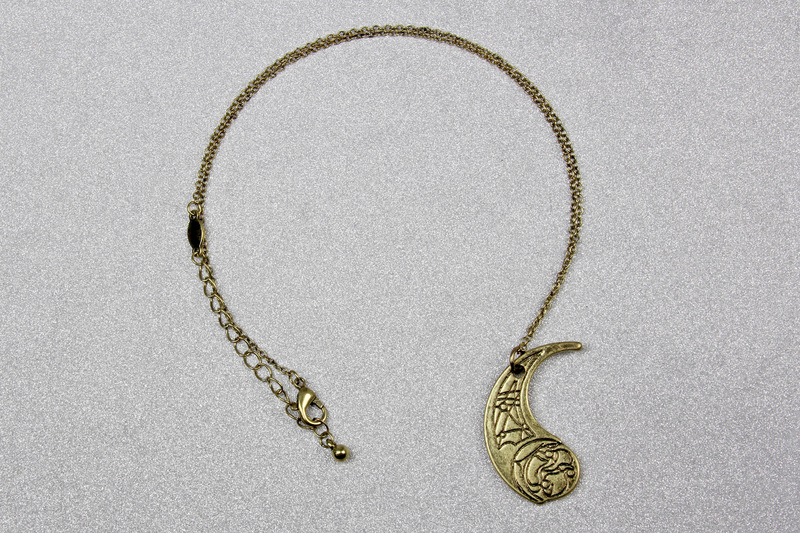 Each necklace also features a small inset charm that joins the necklace chain end to the adjustment chain. 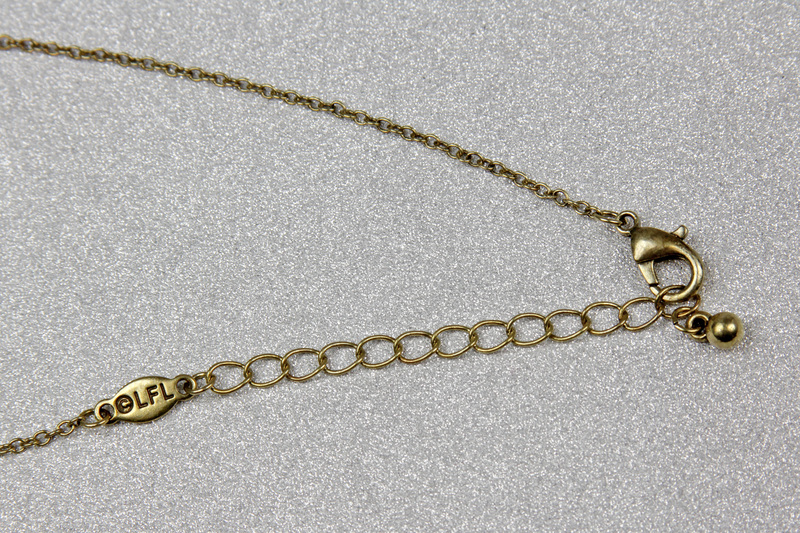 This inset charm features ‘©LFL’ embossed on on side, noting these are licensed items. The back/other side of the inset charms are flat/blank. Many licensed Star Wars necklaces feature the copyright stamp on the pendant itself, so I am quite happy to see that Body Vibe have instead put it on the chain. The Haysian Smelt pendants are double-sided, so there isn’t the usual spot on the back to place the copyright stamp/text without interfering with the design. 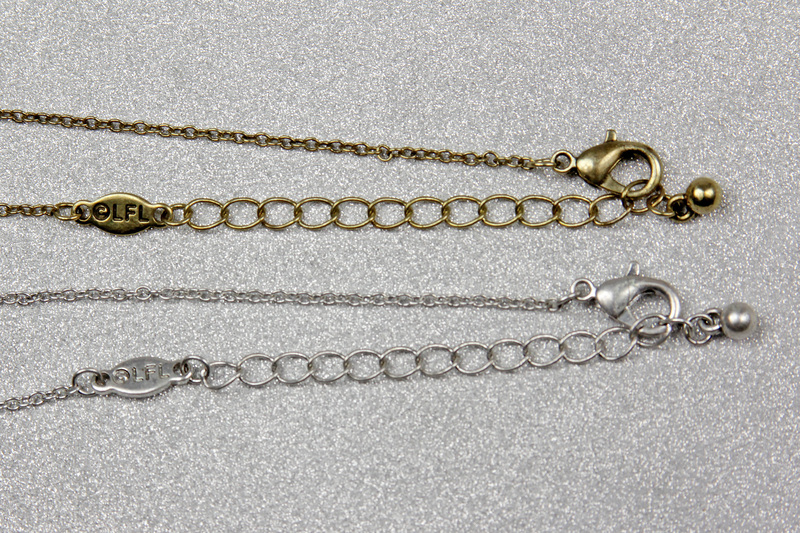 The chains for both necklaces are the same length – approximately 41.5cm long, including clasp and inset charm, with a further 5.5cm of adjustment chain. This is a little on the shorter side, compared to my collection of Star Wars necklaces – but it works well with the necklace style. I am so excited to see Body Vibe expanding their range to include designs inspired by jewelry and accessories from the Star Wars films. As such prominent items in The Last Jedi, these Haysian Smelt necklaces were on my wish list the moment I saw them on screen.